As anticipated, Donald Trump's recent US national security strategy (NSS) airbrushed climate change out of existence. If only it were that easy. Although not surprising, the removal of climate change as an issue of strategic import is a folly that won't be without consequence. In the short term, US defence comptrollers will be reluctant to fund the necessary climate adaptation and mitigation programs needed to prepare US military forces for an array of climate risks: sea-level rise, storm surges, extreme weather, altered precipitation patterns and so on. As the largest military force on the planet, and owning an unrivalled amount of real estate, the US military has much to lose. Removing climate change as a strategic priority will also drive US military planners into a world of funhouse mirrors, where important decisions will be based on distorted perceptions. In this situation, military planners will adjust their language to suit circumstances. A case in point are the new 'double-decker' piers being constructed at US Naval Station Norfolk. Behind closed doors, it's admitted that they're needed in-part to accommodate projected sea-level rise. But to get them approved by politically observant bureaucrats and ideologically sensitive apparatchiks, the story is that they're needed to improve the 'combat readiness of the Atlantic fleet'. The change will also send mixed signals to the US national security establishment, entrenching climate change as an 'on-again, off-again' issue subject to political whim. Clearly, it's 'off-again' in the US for the moment, and observers can anticipate that subsequent strategic policy documents will follow suit. The omission of climate change from the recent US national defense strategy is just one of a number of examples where this will occur. It has also produced an extraordinary juxtaposition between the Secretary of Defense, Jim Mattis, and his commander-in-chief. Mattis has said, 'I will ensure that the department continues to be prepared to … address the effects of a changing climate'. This pits him not only against Trump, but also against other climate-skeptic cabinet appointments who are working at every turn to obliterate any semblance of progress that had been made during the Obama presidency. The policy confusion is striking. Whereas the latest NSS removes climate change as a strategic threat, the 2018 National Defense Authorization Act actually directs the US military to assess and report on climate vulnerabilities. From whom do combatant commanders and military planners take their cues? Uncertainty abounds. More broadly, the abolition of climate change as a US security threat is another small -- but consequential -- example of the current US administration relinquishing global leadership in addressing climate change. Small island states and allies alike (including Australia) who previously looked to the leadership of the US Department of Defense in mitigating climate security risks will be disappointed as funding, research, engagement and programs addressing such risks come to a grinding halt. It's a fresh opportunity for China to enter the void. The downgrading of climate change as a strategic priority, however, doesn't diminish the real-world threat that climate change poses. If anything, the situation worsens each passing year. The concentration of CO2 in the atmosphere has now consolidated above 400 parts per million (ppm) (the highest level in 800,000 years). Last year was the hottest on record in a non-El Nino year. Indeed, if all greenhouse gas emissions -- methane, nitrous oxide and chlorofluorocarbons -- are counted, the equivalent amount of CO2 is nearer 500 ppm. In addition to that, new regulations introduced to clean up the air are likely to reduce aerosol pollution around the world in the 21st century. Ironically, that will exacerbate climate change, as aerosol pollution actually cools the planet by reflecting sunlight! Removing it from the atmosphere will accelerate global warming, potentially adding an additional 0.5--1.0oC. The situation is grimmer than is generally known and reported. Climate change, interacting with other circumstances, will continue to be a driver of global instability. There are myriad examples, but one is presently unfolding in Cape Town, South Africa, where the army is on standby as water engineers prepare to turn off the water supply. Unless replenishing rains arrive, residents' water will be cut in early July, the so-called 'Day Zero'. Residents will be rationed to 25 litres per day. To paraphrase an early CIA report on climate change, Cape Town city planners have failed to 'imagine the unthinkable'. Meanwhile, in Australia the Senate inquiry into the national security implications of climate change concluded its hearings last year and is due to report back to Parliament in late March. Significantly, the ADF's submission to the inquiry stated that it has been 'progressively embedding climate change into its core business functions', which covers 'policy setting, planning, operations, preparedness, capability … estate and environmental management'. Running to 14-pages and covering a wide range of climate-related issues, the ADF submission is the longest and most complete official enunciation of its approach to climate change to date. These are encouraging signs and indicative of some progress. The challenge, however, will be to transform the ADF's disparate and isolated actions into a credible and enduring strategy that can withstand political uncertainty like that now being experienced in the US. Michael Thomas is a climate security analyst and author of The securitization of climate change: Australian and United States' military responses (2003--2013). 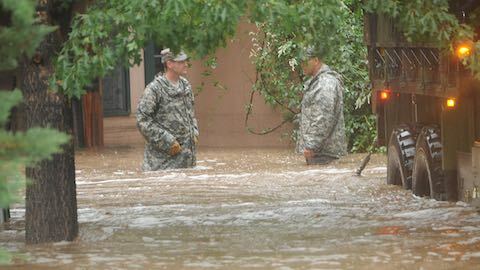 Image courtesy of the Colorado National Guard via Flickr. Environment: "Climate Security in the Trumpian Era"